For some a simple marathon is not enough. 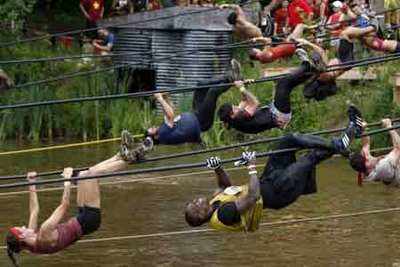 That's when an obstacle course race grabs their attention. The USP of Yak Attack is that you will 'cycle' on the Himalayas. That means that you will be mountain biking on one of the highest mountain ranges in the world. Besides the muddy and rocky terrain, you will have to race as your oxygen levels diminish. Suffocating as it may sound, Yak Attack has attracted international mountain bikers. However, it's mostly won by people from Nepal - we're sure those mountain lungs hold them in good stead! This 400kms race that lasts over 10 days is considered one of the toughest races to complete. From mountain biking to the highest point we take you running to the lowest point of the Earth. Yes running from Amman to the nature's marvel - the Dead Sea - is like running through a desert. The Dead Sea marathon is actually a fund raising event for the Neurological Society by HRH Prince Raad Bin Zeid. Place : Begins at Amman and ends at the Dead Sea, Jordan. Michelle Kakade from Pune is the first Indian to participate in the Gobi March this year. This seven day race covers 250 kms across the Gobi dessert. Racing through the desert is a brutal test of fitness and survival. The extreme hot and cold temperatures challenge you mentally and physically, not to mention the different terrains from sand dunes to river beds. What do you think about racing down on the world's largest and deepest lake, not to mention frozen lake? Sends a chill down your spine, we bet! This ice running marathon is part of Baikal Nordic Games festival. If running on ice is not your thing you can try other sports like ice fishing, ice expedition, cross country skiing competition and sledging too. We had to end with the Everest marathon, which is the highest marathon in the world. The marathon is 42 km that challenges every aspect of muscle, lung capacity, and mental strength. Participate at your own risk.